What's it all about? - A unique opportunity for you to join me as I travel around the UK in search of that ever elusive Perfect Landscape Photograph. Every week I plan and travel around the UK in search of wonderful Landscape Photographs. Well, that's the plan! I am offering 1 or 2 people the opportunity to come along and experience a full-on vlogging day. Below you will find a list of days and locations I intend to shoot in the next 2 weeks. If one of these suit you, then why not come and join me? 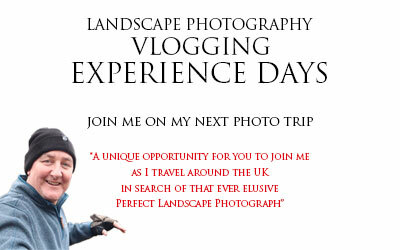 This is perfect for anyone that has an interest in Landscape Photography and/or Filmmaking! What's in it for me? - In brief, you can experience my typical day, out and about shooting and filming Landscapes for my weekly YouTube channel. You can even help with the filming if you like! You can watch my workflow. You can see how I choose one location/composition over another. I will talk you through my camera settings but most importantly the reasons I choose certain settings. You can, of course, take loads of photographs too. I'll be there to help with that. It's almost like a one-to-one/two training session.